Our Original Salsa is the one that started it all. The finely blended tomatoes, onions, garlic and cilantro come together in a classically Californian combination that brings to mind the originality of our local culture. We gave it the name because our flavor, like our town, truly is “Original”. 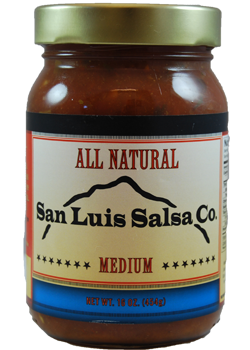 San Luis Original Salsa is packed in 16oz. jars and available individually or in one of our variety packs. Want a little variety? Check out our Variety Pack which offers each of the San Luis Salsa Company Flavors. A combination of our Original (mild) and Habanero salsas. The two come together to create the classic blend of flavor and heat without the intensity of our Habanero and Jalapeno salsas. The perfect salsa for those who like it somewhere in the middle. 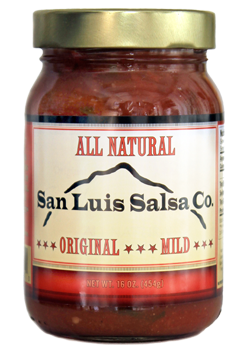 San Luis Mild Salsa is packed in 16oz. jars and available individually or in one of our variety packs. Jalapeño Salsa – Hot – Some Like It Hot. And our Jalapeño salsa is just that! This spicy stand-out is made with a unique blend of sweet jalapeños and tomatillos, onions, cilantro and spices. Our Jalapeño Salsa is sure to satisfy any craving for a little heat. 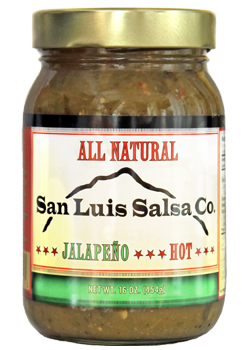 San Luis Jalapeño Salsa is packed in 16oz. jars and available individually or in one of our variety packs. 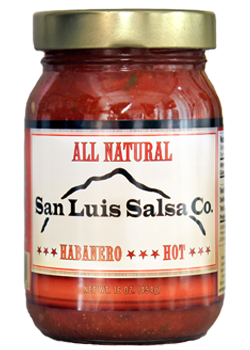 San Luis Habanero Salsa is packed in 16oz. jars and available individually or in one of our variety packs.